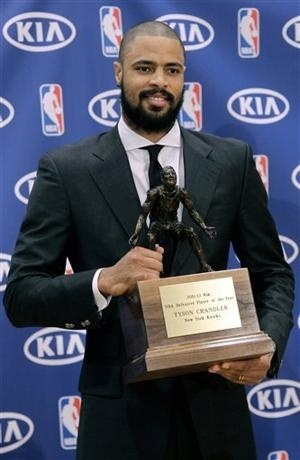 New York Knicks center Tyson Chandler was named the NBA’s Defensive Player of the Year on Wednesday. Serge Ibaka of the Oklahoma City Thunder finished second and Dwight Howard finished third in the voting. Chandler is a beast. A shame the rest of the Knicks don’t want to defend :).